Sometimes one comes across a previously unfamiliar work that just blows one away. Karl Amadeus Hartmann’s Simplicius Simplicissimus did that to me. It’s a work written by Hartmann in 1934/5 as he watched the early years of Nazi power and the banning of “degenerate” art. By the time it got its premier in 1949 it’s story of a Germany physically and morally ravaged by war would seem all too prescient. It’s a simple story based on the early chapters of a novel by Grimmelshausen set during the Thirty Years War(1). It concerns a simple shepherd boy who is drawn into the conflict. There are three scenes. In the first, the entirely innocent boy witnesses the brutal destruction of the farm he works on by vagrant Landsknechten. In the second he is befriended by a hermit and undergoes a sort of moral education before once again being left abandoned by the hermit’s death. In the thirdhe becomes jester to the drunken and corrupt Governor; the idiot who tells the truth, until all is overthrown by a Peasant’s Revolt. It’s quite a short work at around 85 minutes and structurally a bit peculiar in mixing very large scale with very intimate scenes. It’s also musically complex. Besides an atonal language of his own, Hartmann pays tribute to banned composers such as Prokofiev and Stravinsky as well as working in themes from the time of the Thirty Years War and The Peasants’ War. There’s also quite a lot of spoken narrative. It’s highly effective. 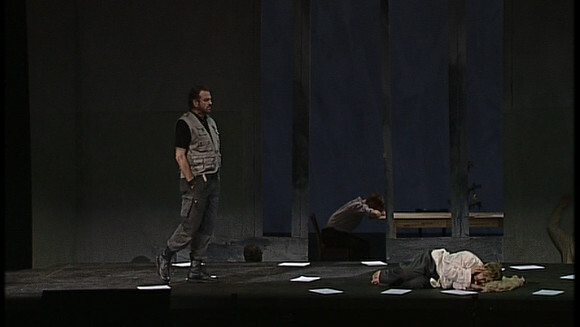 The “destruction of the farm scene” is one of the most chillingly violent combinations of text and music I have ever heard, yet Hartmann can also relax the tension. Indeed he can be positively elegiac. The piece apparently enjoyed a certain vogue in Germany in the 50s and 60s in a version for large orchestra before dropping out of fashion. 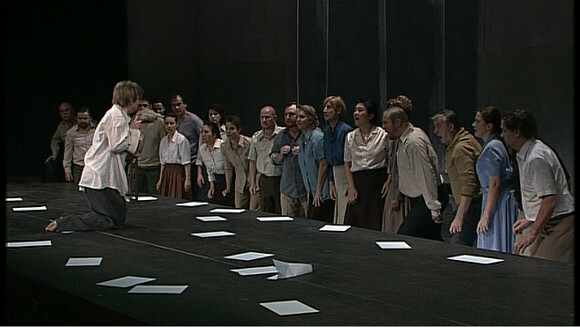 For their 2005 revival at the Staatsoper in Stuttgart, director Christof Nel and conductor Kwamé Ryan chose to go with an abstract staging and the composer’s arrangement for chamber orchestra. Good choices I think. A literal staging would be very hard to manage and the smaller forces seem to create a crispness that matches the stage action. 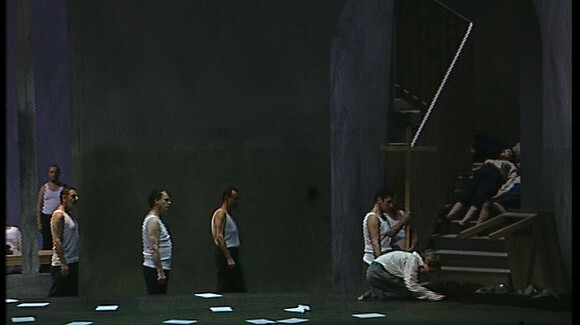 So, what we see is a cast in modern dress almost miming the drama on a virtually naked stage. It puts a lot of pressure on the cast to project a mood but they manage admirably. At the core of the piece is Simplicius himself, sung by mezzo Claudia Mahnke. It’s a performance that justifiably won nominations for Opera World‘s “Singer of the Year”. She’s well backed up by a cast mostly drawn from the Staatsoper’s ensemble and including Frank van Aken as the Hermit and Michael Ebbeke as the Landsknecht. The chorus is outstanding and the small orchestra copes very well with the varied demands of the music. The recording is a bit barebones but quite adequate. 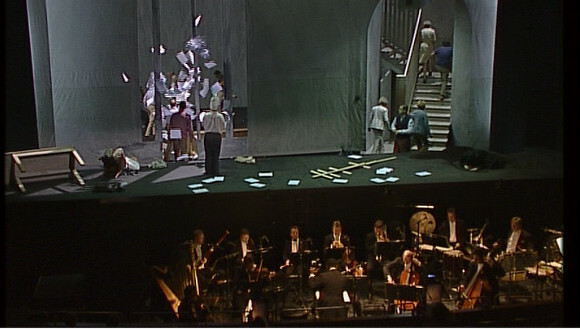 Hans Hulscher’s video direction is sympathetic and makes no attempt to make the stage action look more “realistic”. The picture quality is OK pre HD DVD quality and the stereo soundtrack is surprisingly vivid. There are no extras on the disk but the booklet, besides a track listing and synopsis, includes a long and interesting discussion with Nel and Ryan about the production. Subtitle options are English, French, German, Spanish and Italian. This is a disk I can strongly recommend for anyone with an interest in modern opera and Entartete Musik in particular. It invites comparisons with Zimmermann’s Die Soldaten, though this recording is on a far more intimate scale than the Salzburg version of the Zimmermann. It’s also less morally nihilistic than Die Soldaten. Actually, given that Simplicius Simplicissimus can be performed with relatively small forces it’s a bit of a mystery that it isn’t given more often. FN1: The work is very much framed by The Thirty Years War and its place in the German collective memory. Since this most apocalyptic of wars occupies almost no place in the collective mind of the English speaking world, occupied as it was with its own crises, English speakers unfamiliar with it might want to do some quick reading. 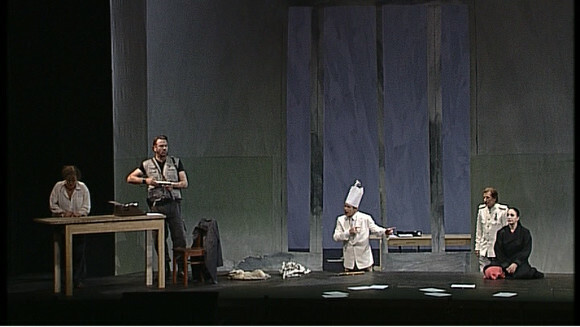 This entry was posted in DVD review and tagged dvd, ebbeke, hartmann, hulscher, mahnke, nel, ryan, staatsoper stuttgart, van aken by operaramblings. Bookmark the permalink.